* Pranveer Singh Institute of Technology, Kalpi Road, Bhauti, Kanpur-208020, India. Doctors’ collaboration with other health care provider is common in health care. But in Indonesia, especially collaboration between doctors and pharmacists is still rare mostly in primary health facilities. Pharmacists have a strategic role in helping patients improve the quality of therapeutic outcomes and will be achieve through collaboration with doctors. The concept of interprofessional collaboration in medication therapy management (MTM) is very important in national health insurance era especially in improving health problems with chronic diseases. This study aims to explore the potential of interprofessional collaboration between doctor and pharmacsts in MTM at type 2 diabetic patient. This study was conducted through indepth interview as an early stage, explore the information of doctors and pharmacists to identify understanding about MTM and hope for collaboration. Nine doctors and ten pharmacists were involved from public health center and community pharmacies as a primary health care, which service patients with type 2 diabetes mellitus and follow referral program from board national health insurance in Jakarta from January to April 2017. Content analysis was used to identify findings on indept interview results, making interview transcripts, categorization, coding, theme setting, and interpretation. This study concluded mostly pharmacist who understand MTM, while physician is not familiar yet. With other pharmacists in the network have not formed cooperation with doctors. Both of them agreed to collaborate through agreement by sticking to their respective duties and authorities firstly by conducting meeting followed by discussion about the patient’s case, then making an agreement with the permanent tasks and authority of each profession. Food or drinks may significantly alter the pharmacokinetics and pharmacodynamics of drugs which may lead to adverse events. A drug such as theophylline is widely used to treat asthma and chronic obstructive pulmonary disease. Pomegranate and licorice have been identified to help in cough management. However, the interactions of the later with theophylline pharmacokinetics were not studied. Therefore, we aimed to study the impact of pomegranate and licorice on theophylline pharmacokinetics in rats. An HPLC method of analysis was developed and partially validated successfully according to the European Medical Agency Guideline to measure theophylline in rat plasma. Pomegranate and licorice juices were given to rats for two days and half an hour before theophylline (5 mg/kg) was orally administered as solution. Blood samples, then, were collected at scheduled time intervals, processed and analyzed using the validated reliable HPLC method. Plasma profile of theophylline was obtained and pharmacokinetic parameters (Cmax, Tmax and Area under the curve (AUC)),were calculated for each group. Values of the pharmacokinetic parameters were compared statistically using ANOVA, t-test with corresponding control values on 95%confidence interval. It was found that consumption of pomegranate or licorice juice prior oral administration of theophylline did not result in significant pharmacokinetic interaction. Tretinoin (TTN) is indicated for treatment of acne vulgaris, melasma, photoaging, follicular keratosis and disorders of keratinization. 5 Fluorouracil (5FU) is a medication which is used in the treatment of cancer. It belongs to the family of drugs called the antimetabolites. The objective of the research work was to design novel liposomes containing 5FU and TTN and optimization of liposomes was done by 32 full factorial design. The effect of independent variables was determined on dependent variables. Liposomes were prepared by ethanol injection method and evaluated by Transmission Electron Microscopy (TEM), entrapment efficiency (EE), Fourier Transform Infrared Spectroscopy (FTIR), zeta potential and in vitro drug release. Optimized formulation was subjected to stability studies at 40C, 250C and 600C temperatures. FTIR spectrums of the pure drug, soya lecithin, cholesterol and their physical mixtures was performed and noted that there was no possible interactions between drugs and the other ingredients. No drug crystals were visible in TEM-images, regardless of the preparation technique or the loaded drug. The average percent drug entrapment efficiency of F9 showed a maximum drug entrapment of 72.86% and 69.70% for 5FU and TTN respectively. 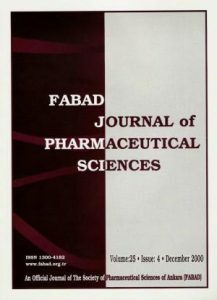 When phospholipid concentration was increased from 40 to 60 mg/ml, the encapsulation efficiencies of formulation increased. High amount of drug release (30.6 to 67.42%) was observed at 2 h. from formulations F1 to F6. Drug release profile of F9 showed a best fit to the desired control release of drug. Stability study showed that liposomes were not stable at high temperature but formulations were most stable when stored at lower temperature i.e. 4oC. Thus, in the liposomes both hydrophilic and hydrophobic drugs were successfully incorporated and it can be further used for formulation development. metabolites in the mouse airways in a model of experimental airway inflammation. For this purpose lipopolysaccharide (LPS) was intranasally applied to mice and fourty eight hours later their lungs and plasma were isolated in order to perform metabolomic analysis. Metabolomics is a very powerful technique using combined gas chromatography with mass spectrometry (GC-MS) aimed to identify and quantify as much as metabolites in a biological system. The metabolomic profile of LPS-applied and control mice were performed on the lung homogenates and plasma samples. GC-MS based metabolomics profile allowed to identify 87 and 244 metabolites in lung and plasma samples, respectively. The multivariate analysis results showed that a significant difference between LPS and control groups were obtained in lung and plasma samples. As a result of analyses, pyruvic acid, glyceric acid, adenosine, nonanoic acid and monomethylphosphate were increased, dehydroascorbic acid, theorine, 3-hydroxyaspartic acid, palmitic acid, palmitoleic acid, valine, succinic acid, lactic acid, tetradecanoic acid, ethanolamine, and N-methylglutamic acid were decreased in the lung homogenates, and urea, linoleic acid and L-alanine were decreased in the plasma samples isolated from LPS-group of mice. These results indicate that the purine and energy metabolisms are affected by airway inflammation. This review includes plants belonging to the subfamily Amygdaloideae of the Rosaceae family and traditionally used by the people around the world. Firstly, systematic information about the Rosaceae family was given. After that, the parts of the plants traditionally used by the public, their form of preparation and their intended use has been reviewed in detail. Information on the traditional use of plants has been grouped according to continents. The most commonly used species belonging to the subfamily Amygdaloideae were Cydonia oblonga, Rosa canina, Amygdalus communis, Agrimonia eupatoria and Rubus sanctus. In addition, information on the use by the public of Cotoneaster species grown in Turkey were compiled and ethnobotanical data about this genus have been expanded. chromosome. This genetic abnormality is a diagnostic feature of chronic myeloid leukemia. Chronic myeloid leukemia is a crucial example of the fact that specific molecular target therapy alters the natural course of malignant diseases, and has been helpful for the development of specific and targeted therapies for many malignant diseases where effective drug therapy is not available. The increase in the functions of protein kinases has revealed the role of these enzymes in cancer, and it has been thought that cancer could be treated when these functions are suppressed. As a result of the studies, the first tyrosine kinase inhibitor imatinib mesylate was developed and was approved by the FDA in 2001. Imantinib mesylate was developed as a targeted drug and has become the most promising compound in terms of clinical development. While developing other tyrosine kinase inhibitors, imatinib was used as a prototype and the chemical structureactivity relationships were studied. Cancer, Chronic myeloid leukemia, Philadelphia chromosome, BCR-ABL gene, Tyrosine kinase, Imatinib. Crocus sativus L. belongs to the family Iridaceae, is a precious plant known as saffron and commonly used as a spice in Anatolia and all over the world. The stigmas of C. sativus, powdered spices from dry stigmas and the plant itself are known as saffron. The taste of the saffron plant originates from picrocrocin the smell from the safranal and the color from the crocin. Safrron is a spice that has been known in Anatolia since ancient times and is widely grown and exported even during the Ottoman period. However, the cultivation and production of our country is decreasing. Saffron is a sought-after medicinal plant because of its important pharmacological effects as well as its wide usage area in various industries such as dye, food and cosmetics. Besides the traditional use, anticancer, antioxidant, antiasthmatic, aphrodisiac effects, effects on skin problems and positive effects on the nervous system, especially on memory are supported by studies. In spite of the high commercial value of the plant and its proven important pharmacological effects, its production and useage are gradually decreasing in Turkey. Therefore, it has been the main purpose of this review to emphasize once again what we can do to better recognize the saffron, cultivate more efficiently, and use it correctly.